A delightful dinner last night with a Scout friend who had worked in my team at the Jamboree. Carine is Belgian and is teaching French in a school outside Göteborg. 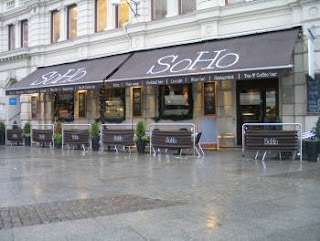 We went to Soho, a restaurant my guide book told me was the hip place to be. The food was excellent and it was lovely to see Carine and hear her news. And then, back to the hotel for the excitements of the Eurovision Song Contest. With, of course, Swedish commentary. Very serious sounding. Not ironic at all. This morning I’m off to explore the town a bit more before heading back to the airport. It really has been a very jolly weekend.